Cape Town radio host Pippa Hudson interviews Archbishop Thabo on his memoir. Dear brothers and sisters in Christ, dear people of God of St Thomas, it is a great delight to be with you today and share in your confirmations. 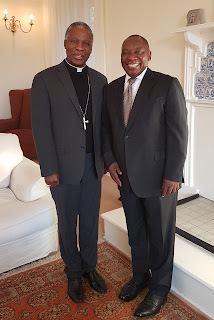 Archbishop Thabo Makgoba met South African Deputy President Cyril Ramaphosa at Bishopscourt today, where they discussed structured partnerships between Church and State. This year we are celebrating the 25th anniversary of the ordination of women as priests in our Province. Bishop Margaret Vertue of False Bay and the ACSA gender programme have been discussing the impact that women's ordination has had on the church. While they have acknowledged that there is much to celebrate—and I believe we have been immensely enriched by their ordination—it is also clear that the church still has many challenges to overcome when it evaluates the leadership, empowerment, participation and inclusion of women, both ordained and lay, in the church today. Cathedrals and churches on four continents have come together to raise awareness and activism about water by launching the JustWater website. This website is part of a new project focussed on celebrating, protecting and ensuring equal access to the gift of water for all, with an international programme organised by St George's Cathedral (Cape Town); St Paul's Cathedral (London); St Paul's Cathedral (Melbourne); and Trinity Church Wall Street (New York). Archbishop Thabo spoke at the launch of the initiative in London. Thank you Dean David and your team for inviting me here to help launch this initiative. Hillary and David are spoiling me at the deanery – thank you for your generous hospitality. Barbara thanks for all the practical arrangements. As I was preparing for this event, we learned in Cape Town that as a result of diminished rainfall over the past year, the dams supplying water for our metropolitan area are only 29 percent full, this at a time when we cannot expect our winter rains to begin before May. While I won't go here into the linkages between the El Niño phenomenon and global warming, our water crisis had the effect of concentrating my mind on how precious water is and on how devastating the effects of scarcity can be. Good morning! How exciting it is to be with you, here in the Church of South India, a church with such a rich and glorious history, in this vast nation. Coming from a country which finally overthrew its colonial past and achieved democracy only 20 years ago, it is inspiring to be here with you in the largest democracy on earth. Thank you Bishop Thomas for inviting us to your Diocese and for asking me to preach at this auspicious Convention Mass, and warm congratulations to you on your election as Moderator. REFLECTING, PRAYING AND ACTING TOGETHER, a series of Bible studies for Lent commissioned by Archbishop Thabo Makgoba is now available online for downloading and printing by parishes and Dioceses. On January 6th, we celebrated the Feast of the Epiphany, reminding us of the manifestation of God to all. For our context today, I want to paraphrase this by expressing it in terms of the liberation, the enlightening, the empowering and the “making able” of all God’s children in order to engage with God in his world and with one another so that none is dominated nor demeaned. Education embodies this vision. Hence, in keeping with our ACSA missional priority of “nurture of the young” this Ad Laos is dedicated to education. Our Anglican Board of Education (ABESA), the Anglican Students' Federation, the Synod of Bishops and other organisations within our Church have been consulting in recent months on how we can engage with the crisis on our campuses in South Africa and beyond. The South African Council of Churches has also been taking initiatives and a number of our bishops have been responding to developments on campuses in their dioceses, among them the bishops of Pretoria, Johannesburg, Grahamstown, Port Elizabeth and the Free State. Good education is, as I have said before, at the heart of our capacity to realise our Provincial Vision, “Anglicans Act”. Although the South African matric pass rate has improved, the quality of our school-leavers' education still needs a lot of improvement. And it is critical both for fulfilment in the lives of young people, and for the health of our society, that the burgeoning growth in tertiary education is well managed, sustainably financed, and kept at the highest possible level of educational quality. As in the 1976 generation, young people today are bypassing their parents and demanding to be treated as adults who can negotiate their own educational destinies. Meanwhile the Government triggered their anger last year by sidelining its own commission on higher education, and announcing a fee increase for 2017 unilaterally. No wonder young people feel abused, marginalised and degraded. At the same time, many young people speak of their vulnerability when it feels as if their parents’ generation – families, teachers and the churches – seem to have left them exposed to abuse, violence and intimidation, unheard and unaccompanied in deep waters. We need to redress that by standing with our students, listening to them and shielding them from danger. When church leaders went to pray at Parliament after a student march in Cape Town last year, there was a warm response as if somehow there was a dimension missing in the conflict – something spiritual which many students knew from their upbringing, and which they miss in secular dialogue. We already have the first Sunday in February each year designated as Education Sunday across the Province, a time to pray for educators, learners and institutions of learning at the beginning of the school year. We want to urge this year that we observe this day, SUNDAY 5 FEBRUARY 2017 with special events not only at churches but ecumenically at schools and where possible on campuses where we have access through Anglican students, administrators or chaplaincy ministry. This is a time to listen and to be close to people not only in the tertiary sector but as the crisis extends, as it will, to high schools and across society. Our presence, our prayers and where appropriate, our parenting are needed, alongside our prophecy where the powerful have also been absent and unapproachable, or simply overwhelmed. We all know how disabled our education systems have been, especially in South Africa but also through the colonial histories of other countries which make up the subcontinent which ACSA seeks to serve. Building healthy education systems in all our nations is a critical priority to which ACSA has long been devoted. As we do so, there are people full of passion and potential for whom we have to care. Please observe Education Sunday with special intent for universities and colleges in the tertiary education sector this year! The Archbishop of Canterbury, the Most Revd Justin Welby, has declared international Anglican support for Archbishop Thabo Makgoba after controversy between Church and State in South Africa. 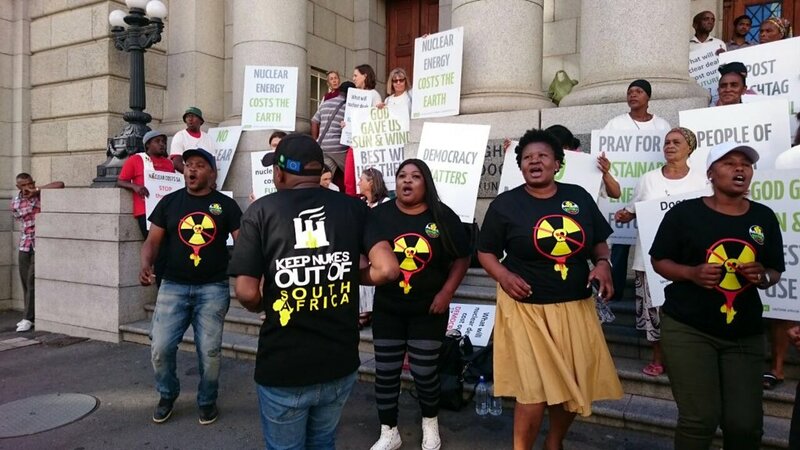 The support was expressed in a sermon preached at Evensong in St. George's Cathedral, Cape Town, on December 30.